Iran has upgraded its S-200 long-range air defence missile system in an effort to improve its operational capability, Khatam ol-Anbia Air Defense Base commander brigadier general Farzad Esmayeeli has announced. Esmayeeli was quoted by Fars News Agency as saying that a mobile launcher had been developed for the system, in addition to a sharp reduction in its detection-firing-tracing time. ”We have given mobility to the S-200 missile system, and the same plan to give mobility to all artillery and missile systems is on the agenda of the Air Defense Force," he said. Working both online and in real-time, the upgraded system can also be employed for pinpoint targeting missions, and has successfully proved its capabilities in different tests. "In the missile part of the system, we should say that S-200 is not only used against strategic and collective targets, but it can now be used for pinpoint targeting and can be guided to a very specific point," Esmayeeli added. "The optimised S-200 system is expected to be unveiled during the forthcoming military exercise, code-named Modafe’an-e Aseman-e Velayat 5, which is scheduled to be held in the next six months." The optimised S-200 system is expected to be unveiled during the forthcoming military exercise, code-named Modafe’an-e Aseman-e Velayat 5, which is scheduled to be held in the next six months. Designed by Almaz/Antei Concern of Air Defence in the 1960s, S-200 Angara is a long-range, medium-to-high altitude surface-to-air missile (SAM) system used to protect large areas from bomber attacks or other strategic aircraft between a 200km-350km range, depending on the variant used. Also known as SA-5 Gammon, the single-stage missile features four jettisonable, wraparound solid propellant boosters, and utilises a radio illumination mid-course correction to move towards the target with a terminal semi-active radar homing phase. Each battalion comprises six single-rail missile launchers and fire control radar, and can also be linked to other longer-range radar systems. 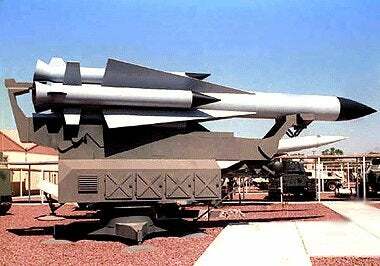 Image: A S-200 missile model mounted on its launcher. Photo: courtesy of Nvinen.